Chapati is an unleavened flatbread common in many South Asian countries. 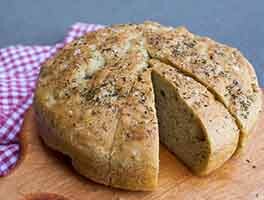 Made with white whole wheat or sprouted wheat, this bread is easy to roll out; has a mild, slightly sweet flavor, and is a quick accompaniment to serve alongside most any meal. If you're serving a crowd, this recipe doubles nicely. Stir in the oil and hot water, adding more water if necessary to make a soft, elastic, slightly sticky dough. Knead the dough on a lightly floured work surface until it's smooth, about 1 minute. Divide the dough into 6 pieces and shape them each into a ball. Cover the dough balls and allow them to rest for about 15 minutes. Preheat an electric griddle to 375°F, or set a heavy-bottomed skillet over medium heat. Roll each dough ball into a 6" to 7" circle; the circles will be thin, like a tortilla. Lightly oil the griddle or pan, and fry one dough circle for about 30 seconds, until lightly browned on the bottom. Flip and fry the second side of the dough, pressing it down gently with a spatula if it starts to puff. Cook for an additional 30 seconds, until golden. 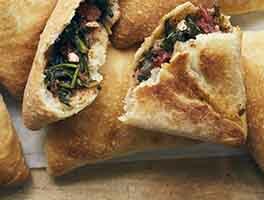 Cover the cooked flatbreads with a clean towel while you cook the remaining pieces. Serve warm. Store cooked flatbreads, well wrapped, at room temperature for several days; refrigerate if the weather is particularly hot and/or humid. For longer storage, wrap well and freeze. 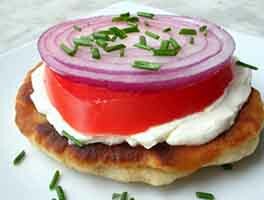 Give flatbreads additional flavor by whisking in 1/2 to 1 teaspoon fresh or dried herbs: oregano, basil, and thyme are all delicious options. Add subtle sweetness by adding 1 tablespoon brown sugar with the flour. Spread the warm flatbreads with your favorite jam and enjoy for breakfast, or as a snack. Want to use this dough to make tortillas or quesadillas? Divide it into three portions and roll larger, 10" to 12". Proceed with the recipe as directed. Too hot to be in the kitchen? 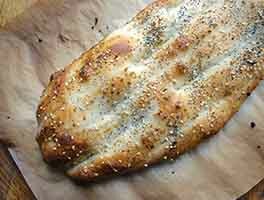 Cook these flatbreads on the grill! Pat the dough into rounds, place on parchment paper, and grill until lightly browned on the bottom. Flip and cook the other side until golden brown. Great recipe I added garlic salt and herbs enjoyed eating every bit of it! Thank you! Watching my sodium, so regular bread is not on my menu (10-20% of DV per slice!). I added cumin and garlic powder, just two pinches of salt. I baked them on my panini grill for about 30 seconds. 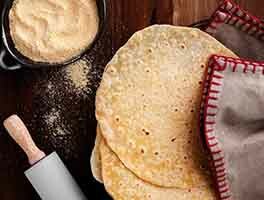 These are more sturdy than tortillas, and make for great roll-ups. I made this as part of the Bake the Bag challenge. I thought it was great - however, I thought this would make a few more flatbreads than it actually did. Easy recipe, came out perfect with little effort. BUT, I am not a fan of flatbread and these had almost no flavor. I would make again for family members. I don't even like wraps because the wrap usually tastes weird. These would make good wraps since to me they have no flavor. This recipe is delicious and fast! In less than 30 minutes they were on the table. I was surprised at how they thickened up upon cooking. So i rolled the remaining ones a little thinner. Easy and delicious. My three kids devoured two recipes worth topped with zaatar. They also go well with falafel and tehineh. (I'm sure chocolate and nuts as well. The possibilities are endless!) I only wonder if there's a way to cook them in the oven because doing them one at a time becomes very time consuming when making more than one batch. I added garlic power, thyme and rosemary. 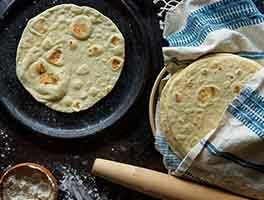 Great and easy Chapati. Loved it! Can I freeze these? Wonderful- quick and easy. Enjoyed this flat bread wrapped around arugula and chicken waldorf salad. The fruit and nuts in the salad paired so well with the flavor of this bread. I rolled mine very thin, so the edges were crispy/crunchy after cooking on the stovetop. Very, very easy. I used my tortilla press to thin out the dough balls...it was PERFECT! I made these to go with some Indian Keema Fry...we ate them "taco" style. Delicious the best part...just enough for two people! thank you for the recipe.